Peruvians went to the polls on April 9th 2000 to elect a president and a new parliament. I went along - to report on what proved to be the first round of the elections and on other issues for YLE TV News. Traveling around the country from April 1st to 12th I also seized the chance to visit a few Peruvian radio stations on the way. Most Peruvian stations are notoriously tough to QSL, so I was armed with a bunch of reception reports from myself and other Finnish DXers. After a few hours of sleep, before dawn on April 2nd, the crew set out on a lengthy journey over the Andes - the crew meaning the driver of a four-wheel drive UN pick-up, me the reporter, my Peruvian field producer and my Spanish cameraman. From Lima, the road rapidly crept up to 4818 meters above sea level. Patches of snow covered the roadside at the highest point in Ticlio, after which the filthy effluents of the Andean mining towns began to flow east, to the Amazon. My field producer was hit by altitude sickness, but the descent was only gradual and so relief took some time. We had a late breakfast in La Oroya with the next stop being in Junín, still 4105 meters above sea level. Junín of course is the home of Radio Libertad, so I couldn't resist paying a brief visit, even though KLM had lost my luggage and I had no reception reports to present them. Obviously, the lost luggage was a much greater problem for my assignment in the selva, the Peruvian jungle, since I had lost everything from mosquito repellent to background documents and all my clothes - all of which I got only after four days when back in Lima. 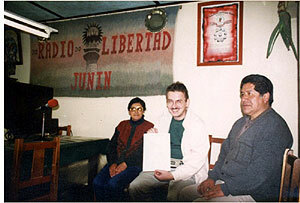 Radio Libertad de Junín (5039 kHz) is located at Jirón Cerro de Pasco No. 582, a dirt alley not far from the beautiful center of Junín. 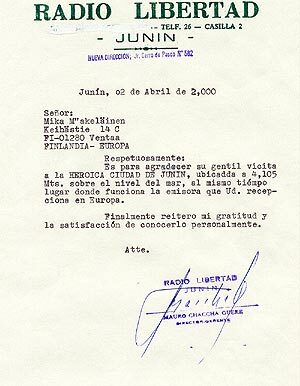 The station letterhead still gives the previous address, Jirón Simón Bolivar 497. I was welcomed by Director gerente Mauro Chaccha Guere, his wife and Luis Molina Llanos, who had just finished hosting the morning program. You may hear Molina's voice also in the early evening hours local time, which is prime time for picking up Peruvian stations in Europe. After Junín our journey took us to the grim mining town of Cerro de Pasco (4333 meters above sea level), where we tried to visit Radio Altura. It was Sunday, and the offices were closed, only the host of the ongoing show was working. He did a quick interview of us, but we weren't able to browse the reports the station had received. We then continued down to the real wild west, the seedy town of Tingo Maria and the adjacent Valle del Monzón (Monzón River Valley), which is the worldwide center of coca growing. Tracing the illegal coca business here in the ceja de la selva (eyebrow of the jungle) of the Upper Huallaga Valley was quite an adventure: at one point we narrowly escaped from being robbed by highway bandits who had set up a roadblock. Several cars were held up before local campesinos took up arms, which resulted in a firefight in the jungle. The only surprising feature of the incident was that eventually someone bothered to inform the police about it. I have spared the details of these adventures for the television audience of my very own TV News and Atlas, a current affairs show of the Finnish Broadcasting Company (YLE). One of my stories from Peru - about coca cultivation and efforts to reduce it - has also been aired on CNN World Report. On the CNN website you can view the transcript of this story - or even order the video. But now, back to the radio scene. Five days later, alive but suffering from high fever as a result of catching salmonella in the jungle, I visited Cusco (spelled also as Cuzco or Qosqo, the politically most correct version). Cusco, at an altitude of 3300 meters, used to be the heart of the Inca empire - Qosqo meaning the navel of the world. The inca nation was called Tahuantinsuyu (or Tawantinsuyo), meaning the four corners of the world. And its current voice, Radio Tawantinsuyo, indeed reaches the four corners of the world. 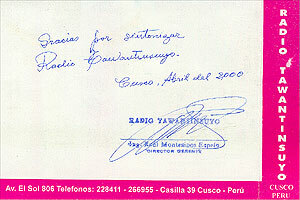 This cusqueña station is an offspring of Radio Tawantinsuyo. 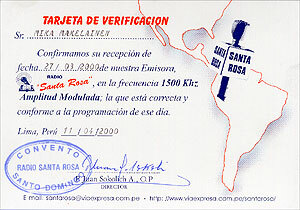 Located in the same block, with an address on Avenida Garcilaso, Radio La Hora (1400 and 4855 kHz) is headed by Edmundo Montesinos G., the son of Raúl Montesinos Espejo. Edmundo learned the trade at his father's station, and later set up a station of his own, with a profile aimed at a younger audience. Accordingly, the station has a slogan La Emisora de la Juventud. Montesinos junior hasn't displayed much more interest in reception reports than his father, but fortunately he has allowed someone else to take care of replying to reports. Mr. Carlos Gamarra Moscoso works at the station and is a shortwave listener himself. Some sources name him as Director, but he is (only) Director de Frecuencias. I believe that in this case title matters, as Mr. Montesinos might find it a bit annoying if the person getting all the mail is being called the boss. Carlos was not at the station when I visited, but luckily he came by at the hotel later, when I was bedridden with fever. Although difficult, I will try to comment something without risking a libel action. To put it briefly, despite feeling very sick, I endured nearly two hours at the station, because they wanted to interview me not only on radio (like all the other stations), but also on TV. The company has a local TV channel called CTC. One of the main AM stations in the capital Lima, Cadena Peruana de Noticias, or CPN Radio for short, was actually not very different from the above-mentioned pest. Operating on 1470 kHz, it is heard pretty often in Finland, but never replies to reception reports. On March 23rd I once again heard the station, with its overnight program Haciendo la Noche, and sent another reception report. I told CPN that I would be coming over to Lima. CPN then eagerly tried to get a hold of me, and so I had a bunch of messages waiting for me when I got my election accreditation at the International press center in Lima. It turned out however that they were only interested in interviewing me. Late one evening just before midnight I got a surprise call to my hotel room, and immediately I was taken live for ten minutes. Their mission accomplished, I found it difficult to try to arrange a visit to the station. Finally, on the day of my departure, I had some spare time in Lima, and I visited the station uninvited. The station is not located at the Paseo de la República address given by the WRTH, but the Peruvian postal service still forwards all mail to the correct address, which is Calle General Salaverry No. 156, Miraflores, Lima 18. I was asked to contact Zenaida Solis, Directora de Programas, who kept me waiting in an underground lobby, but did eventully write me a confirmation letter, probably just to get rid of me. I didn't even get to see her. Through a messenger she told me that she was too busy to take a look at the other ten reports I had brought along. I was left with a promise of getting the confirmations later by mail. After a couple of months, Winston Montoya verified part of the reports by e-mail. The national radio is of course a prime example of a pro-government voice, operating under the Ministry of Education, but aside from that, the station gave a very professional image. The oldest broadcaster in Peru (on air since 1925) is based in a mansion-like building at Avenida Petit Thouars 447, Santa Beatriz, Lima 1. The WRTH information also on this one is a bit outdated; at the moment the station is not broadcasting on 6095 kHz, and does not intend to return to shortwaves. Instead, the station is planning to broadcast on the internet. Radio Nacional has several AM and FM affiliates around Peru, in Lima the AM frequency is 850 kHz. Station director is nowadays Carlos Fuentes Chavez. Fuentes was very friendly, and was happy to write verifications for the three reception reports I had brought along (for me, Markus Salonen and Ilkka Suni). And you know who's wearing the famous YLE cap - I got a Radio Nacional cap in return. Another capital station, which has no intention to return to its former shortwave frequency of 6010 kHz. Nowadays transmissions are 24 hours a day, but only on FM 94.3 MHz and the Internet at the Radio América website. Unlike the other Lima stations which I visited, this one is situated in the old downtown. I made a brief surprise visit, as the station happened to be located near the office of the state ombudsman, whom I interviewed. In fact, the station is located inside a monastery, Convento Santo Domingo, at Jirón Camaná 170. The alternative mail address is Casilla Postal 4451, Lima 1.